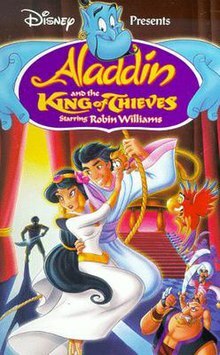 Aladdin and the King of Thieves (also known as Aladdin 3: Aladdin and the King of Thieves) is a 1996 American direct-to-video animated musical fantasy adventure film produced by Walt Disney Television Animation. It is the second sequel to the 1992 film Aladdin, and serves as the final chapter of the Arabian Nights-inspired Disney franchise beginning with the first film, and continuing with its first direct-to-video sequel The Return of Jafar and the animated series of the same name. The film is inspired by the tale Ali Baba and the Forty Thieves from One Thousand and One Nights, replacing Ali Baba with Aladdin, and for the first time since the original Aladdin, the film has a completely new soundtrack instead of the rearranged music from the original film for The Return of Jafar and the series. Though the film serves as the finale of the series, the characters also appear in a 1999 crossover episode of the animated series Hercules, titled "Hercules and the Arabian Night", as well as the 2007 direct-to-video title called Disney Princess Enchanted Tales: Follow Your Dreams. While the Genie and the people of Agrabah prepare for the upcoming wedding of Aladdin and Princess Jasmine, Aladdin retrieves his parents' dagger from his old home, telling the Genie how his father left him when he was a child. Meanwhile, the legendary Forty Thieves arrive at the city to raid the wedding, but Jasmine and the others fend them off, and Aladdin prevents the leader from stealing a specific scepter. After the thieves escape from the city, a powerful Oracle appears from the staff and informs Aladdin that his father is alive, but "trapped" in the world of the Thieves, though Aladdin misunderstands her and believes his father is their prisoner. Aladdin follows the thieves to their hideout on Mount Sesame and reunites with his father Cassim, the King of Thieves, who is surprised to see his own son again after not seeing him for so long. His second in command, Sa'luk, tries to execute Aladdin for trespassing, but the only way to avoid execution is to earn his place in the group by fighting for his life. Sa'luk instantly volunteers to fight Aladdin, but he is defeated. Sa'luk falls off from the cliff to the sea, but survives and gives the hideout's password to Razoul in exchange for immunity from prosecution. Cassim tells Aladdin about the Hand of Midas, a powerful artifact turning anything into gold, which caused him to leave his family in order to eventually lead them out of their lives in poverty. Aladdin persuades Cassim to accompany him back to Agrabah, where he is welcomed by Jasmine, the Genie, and the Sultan, though only the Genie is made aware of Cassim's true identity. By doing so, Cassim is not captured when Razoul and his guards raid Mount Sesame. Sa'luk tells Razoul about Cassim's relationship with Aladdin, and a trap is set for Cassim when he and Iago, still intent on the Hand of Midas, attempt to steal the Oracle's scepter from the Sultan's treasury. Cassim and Iago are sentenced to life in prison by the Sultan. When Aladdin frees Cassim and Iago, he is exposed by Razoul and, after being tempted to leave Agrabah behind by Cassim, willingly returns to Agrabah to face the consequences. The Sultan forgives Aladdin once he realizes that Aladdin acted only to protect his father and not because of malice. In the meantime, Sa'luk returns to Mount Sesame and rallies the few remaining thieves under his leadership by claiming that Cassim has sold them out. When Cassim and Iago return to the hideout, they are captured by Sa'luk and forced to call forth the Oracle, who leads them to the Vanishing Isle (a castle fortress attached on the back of a giant turtle), where the hand is located. Iago escapes and reunites with Aladdin, and the heroes head to the isle. Aladdin saves Cassim, and they work together to retrieve the hand while the turtle begins to dive back under the sea. Sa'luk catches up with them and forces Cassim to choose between keeping the hand or saving Aladdin. Cassim tosses the hand to Sa'luk, who incautiously catches it by its golden palm, which transforms him into a golden statue. Now realizing that his son is the treasure of his life, Cassim discards the hand and reconciles with Aladdin, finally freed from his greed. With all their enemies gone, Aladdin and Jasmine get married at last. Cassim also showed up to indirectly congratulate him, but since he's still an outlaw, he leaves too soon to travel the world along with Iago, who thinks he's finally found a great companion. The story ends with Aladdin and Jasmine meeting up with Cassim and Iago outside of Agrabah so they can bid their farewells before sharing a kiss, while the peddler (from the first film) reappears once more and reprises "Arabian Nights". Following the success of The Return of Jafar and the television series, Disney announced in January 1995 that a third film was in production, and later in June, that it was scheduled for a home video release in 1996. In September 1995, it was confirmed that Robin Williams would reprise the role of the Genie reportedly for a $1 million salary after he received an apology from Joe Roth for Disney breaching an agreement not to use his voice to merchandise products inspired by Aladdin. With Williams on board, all recordings and animation footage of Dan Castellaneta as the Genie was scrapped, and all of the Genie's scenes were rewritten to fit Williams' comic style. "There's a Party Here in Agrabah"
"Welcome to the Forty Thieves"
Two comic adaptations of the movie were on sale September 1996. The first was in Marvel Comics Disney Comic Hits #13. The second was in Disney Adventures Volume 6 #12. Upon its release, the film was accompanied by a marketing campaign at more than $70 million with commercial tie-ins with McDonald's and General Mills. At the time of its release, King of Thieves was reportedly outselling The Return of Jafar, but Disney declined to disclose actual sales figures for the release. In January 1997, The Wall Street Journal reported that it sold over 10 million units, and generated at least $130 million in revenue. In total, the film sold 10.3 million units in the United States. On January 18, 2005, the film was re-released as a Special Edition DVD, with digitally restored picture, remastered sound, two additional games, and a behind-the-scenes bonus feature. However, the film was matted into a 1.85:1 anamorphic widescreen ratio (an aspect ratio Disney has rarely used for television animation at the time). The DVD went back into the Disney Vault along with the other two films in the series in January 2008. Aladdin and the King of Thieves, along with The Return of Jafar, was released on Blu-ray/DVD/Digital HD Combo Pack on January 5, 2016 as a Disney Movie Club exclusive in North America. Based on 11 reviews collected by Rotten Tomatoes, the film received 27% approval rating from critics, with an average score of 4.8/10. Caryn James of The New York Times praised the sequel as "far better than The Return of Jafar", but acknowledged that "the video has some other weak spots, but these hardly matter when Aladdin and the King of Thieves is so brimming with comic invention and adventure." ^ "Company Town Annex". Los Angeles Times. January 31, 1995. Retrieved September 17, 2014. ^ Bloomberg News Service (January 31, 1995). "Sequel To 'Lion King' Set To Roar Into Vcrs Within The Next Year". Burbank: Orlando Sentinel. Retrieved August 15, 2014. ^ "As Long As It Sells, Keep Doing Sequels". Entertainment News Service. The Sun-Sentinel. June 23, 1995. Retrieved August 15, 2014. ^ "Williams Returns In `Aladdin' Sequel". Los Angeles Times. The Sun-Sentinel. November 10, 1995. Retrieved August 15, 2014. ^ Westbrook, Bruce (August 16, 1996). "Robin spins 'Aladdin'". The Houston Chronicle. Aladdin Central.org. Retrieved August 15, 2014. ^ The Music Behind the Magic: The Musical Artistry of Alan Menken, Howard Ashman & Tim Rice: Disc 3: Aladdin (Compact disc liner notes). Various Artists. Walt Disney Records. 1992. p. 4 Note: Track 28 on Disc 3 is called "Arabian Nights, Reprise (Unreleased Master)" that is later used in Aladdin and the King of Thieves. 60014-7. ^ Moore, Steve (August 9, 1996). "'Aladdin' Sequel With Robin Williams Goes Direct To Video". The Washington Post. The Spokesman-Review. Retrieved August 15, 2014. ^ Moore, Steve (August 16, 1996). "Disney Has Wish For Genie". The Washington Post. Orlando Sentinel. Retrieved August 15, 2014. ^ a b Snow, Shauna (August 29, 1996). "Arts and entertainment reports from The Times, national and international news services and the nation's press". Los Angeles Times. Retrieved August 15, 2014. ^ Orwall, Bruce. "Video buying is surprise hit with viewers," Wall Street Journal 17 January 1997, p. B1. ^ Bonanno, Luke (January 16, 2005). "Aladdin II & III Collection DVD Review". DVDizzy.com. Retrieved August 15, 2014. ^ "Out of Print Disney DVDs". UltimateDisney.com. Archived from the original on 29 September 2006. Retrieved 24 September 2006. ^ "Aladdin sequels arrive on Blu-Ray, Exclusive to Disney Movie Club members". Hi-Def Ninja. October 14, 2015. Retrieved June 1, 2016. ^ "Aladdin and the King of Thieves (1996)". Rotten Tomatoes. Flixster. Retrieved August 15, 2014. ^ James, Caryn (August 13, 1996). "`Aladdin 3': Dream Of Genie". The New York Times. The Sun-Sentinel. Retrieved August 15, 2014. ^ a b c "Aladdin and the King of Thieves". 16 November 1997 – via IMDb.